To Cite: Bineshian F, Bakhshandeh N, Taherian K, Nazari H. GC-MS Analysis of Anti-Candida and Antioxidant Activities of Hydroalcoholic Leaf Extract of Chaerophyllum macropodum, Jundishapur J Nat Pharm Prod. 2018 ; 13(4):e13207. doi: 10.5812/jjnpp.13207. Background: Chaerophyllum is a genus from the family Apiaceae. Chaerophyllum macropodum as a wild species is endemic to Iran and Turkey. The leaves of this plant are used in the food industry, as well as medicine. Since resistance has increased in some Candida species, side effects of chemical drugs and the use of medicinal plants are very important. Objectives: We reviewed the antioxidant and anti-Candida effects of hydroalcoholic leaf extracts of C. macropodum. Methods: For the evaluation of the antioxidant potential of C. macropodum extracts, DPPH radical scavenging test, reducing power assay, and β-carotene bleaching test were performed. Moreover, the total free phenolic and flavonoid contents were measured. A GC-MS instrument was used for analyzing the extract components. In addition, hydroalcoholic extraction was performed by agar well-diffusion method against 40 Candida species isolated from patients. Results: According to the DPPH test, a moderate antiradical activity was attributed to C. macropodum leaf extract; maximum inhibition (6.38) was reported at 1000 μg/mL. Based on the findings, the total phenolic and flavonoid contents were 57.43 ± 0.25 and 138 ± 19.80 (mg/g), respectively. The minimum inhibitory concentrations for C. albicans and C. glabrata were 300 and 400 μg/μL at 48 hours, respectively. Conclusions: In this study, a moderate antioxidant activity was attributed to C. macropodum leaf extracts. In addition, the results confirmed that leaf extracts had inhibitory activity against bacteria and Candida species. Therefore, they may be applied as antioxidant, antibacterial, and antifungal agents in food protection. Chaerophyllum genus, from the Apiaceae family, includes nearly 110 species in temperate and sub-temperate regions of Asia, Africa, and Europe. Chaerophyllum (chervil) is a native herb with weak stems and leaves, similar to parsley or parsley-like leaves. C. macropodum is known as “Gazarsare” in Mahdishahr (Sangsar) and “Jafari Frangi Kohi” in Iran. Eight Chaerophyllum species have been found in Iran, including C. macropodum, which is a wild species endemic to Iran and Turkey. The leaves of this plant are used in the food industry, as well as medicine. Previous studies have confirmed the presence of phenolic acids and constituents with cytotoxic and antimicrobial activities in Chaerophyllum species (1-4). Candida species, particularly Candida albicans, are common pathogens in patients with organ transplantation, AIDS, and neoplastic disease, immunocompromised patients, and users of immunosuppressive drugs and broad-spectrum antibiotics. Recently, the use of medicinal plants has been highlighted, as natural products with therapeutic properties are cost-effective, available, and beneficial. In addition, chemical drugs have more side effects. Treatment of some diseases using medicinal plants, especially herbs, is in its infancy. On the other hand, researchers try to detect the active constituents of extracts to treat different diseases. We aimed to examine the anti-Candida and antioxidant potential of hydroalcoholic leaf extracts of C. macropodum via GC analysis. Sigma-Aldrich supplied Gallic acid, trichloracetic acid (TCA), vitamin C, Quercetin, DPPH, Folin-Ciocalteu reagent, and butylated hydroxytoluene (BHT). The spectrophotometric assays were performed with a spectrophotometer (Analytik Jena, Germany). After collecting C. macropodum leaves from Roudbarak in Mahdishahr (Semnan, Iran), they were confirmed by professional botanists. A voucher sample was deposited at the Research Center for Medicinal Plants. The dried samples were powdered for further analysis. For extraction, the powdered leaf (50 g) was mixed with 6:3:1 ethyl acetate: methanol: distilled water (500 mL) overnight. The temperature was adjusted to 40°C in a Soxhlet system for eight hours before the evaporation solvent was incubated at room temperature. The Folin-Ciocalteu method was used according to the literature (5, 6) with some modifications to evaluate TPC. Following two hours of incubation, absorbance was read at 765 nm. For the measurements, the standard Gallic acid (GA) curve was applied, presented as grams of GA equivalent (GAE) per 100 g of dry weight (7). where R represents the standard curve result, D.F denotes the dilution factor, V indicates the stock solution volume, and W represents the plant weight. For the antioxidant assay, after dissolving the sample in 95% methanol at 1 mg/mL, it was diluted for preparation of series concentrations. The reference chemicals were used for comparisons. where Ac indicates the control absorbance, while As denotes the sample solution absorbance. For this purpose, the method proposed by Hinneburg et al. (14) was applied. To measure absorbance, a spectrophotometer was used at 700 nm after mixing the supernatant (2.5 mL) with FeCl3 (0.1%, 0.5 mL) and distilled water (2.5 mL). An increase in absorbance was indicative of increased reducing activity. To prepare the stock solution of linoleic acid and β-carotene, linoleic acid (25 μL), as well as Tween 40 (200 mg), was added after dissolving β-carotene (0.5 mg) in chloroform (1 mL), since β-carotene is not considered water-soluble. Following that, 100 mL of oxygen-saturated distilled water was added during 30 minutes via vigorous shaking at 100 ml/min. Finally, the mixture (2500 μL) was added to tubes and then, the extract (350 μL) was added at 2 g/L. 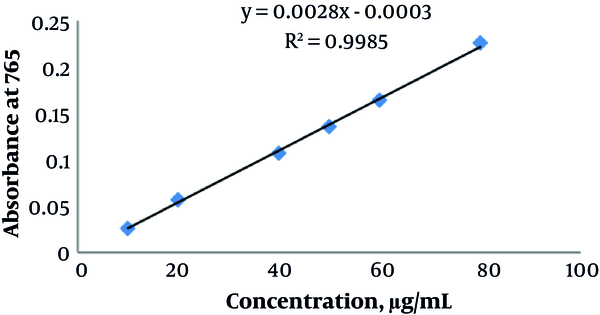 For a final concentration of 400 μg/μL, 2 g of C. macropodum extract was dissolved in 5 mL of DMSO (16). To prepare serial dilutions of 400, 350, 300, 250, 200, 150, and 100 μg/μL, sterile distilled water was used. The reference strain was Candida albicans (ATCC10231). Gram-positive and Gram-negative bacteria included Staphylococcus aureus and Escherichia coli, respectively. Finally, 40 Candida isolates were obtained from women with vulvovaginal candidiasis, including 34 C. albicans and six C. glabrata isolates (17). After culturing the bacterial strains in nutrient agar (NA), incubation was performed for 24 hours at 37°C. Following the inoculation of the Candida isolates in Sabouraud dextrose broth (SDB, Merck, Germany), incubation was performed for 24 hours at 35°C. Then, using sterile distilled water, the yeasts were washed three times and the suspension was used to prepare the 1 × 106 CFU/mL concentration (0.5 MF standard). The positive and negative controls included the fluconazole disc for fungi (10 μg/disc; Hi-Media, India) and gentamicin (10 μg/disc) for bacteria, and DMSO, respectively. After adding the yeast inoculum (100 µl, 106 cells/mL) on SDA (Merck, Germany) and bacterial inoculum (100 µl, 106 cells/mL) on Mueller-Hinton agar (MHA, Merck, Germany), a borer was used to punch six 7-mm wells in the SDA medium; then, 100 μL of the extract dilutions was added, along with DMSO 100% as the negative control (16). The zone of inhibition was measured after incubating the plates at 35°C for 24 hours to determine the anti-Candida activity. The experiments were repeated twice. A GC-MS system (Agilent) with a VF-5 ms silica capillary column (DB-35 ms, 30 m × 250 µm × 0.15 µm) was used for the GC-MS analysis (18), using helium gas (99.99%) as the carrier at a constant flow of 1 mL/min; the temperature of the injector and transfer line was 200°C and 250°C, respectively. On the other hand, the oven temperature increased from 60°C to 280°C at 10°C/min. After maintaining the isothermal temperature for 60 seconds, it increased to 280°C at 10°C/min. In the next step, the sample (1 µL) was injected in the splitless mode (50 - 600 amu; split ratio, 1:10). The total running time was 57 minutes. The retention indices, as well as fragmentation patterns, were compared with the computer library data and literature to identify the extract components. Using the Willey library, the recognized constituents were matched. One-way ANOVA was applied at 95% confidence level in SPSS version 16. In addition, the correlation of antioxidant activity with TPC and TFC was determined via linear regression analysis in Excel 2003. The extraction method, growth, and climatic conditions, as well as genetic factors, influence TPC, TFC, and antiradical activity. However, according to the literature (18), the use of a different solvent system, i.e., ethyl acetate: methanol: distilled water, is preferable for the extraction of antioxidant constituents. The percentage of hydroalcoholic extraction yield of C. macropodum leaf extract was 1.86 w/w%. The high antioxidant potential was confirmed on DRSA, reducing power assay, and BCBT. In this primary assay, odd electrons of DPPH are quenched by the extract to decrease absorbance at 517 nm. The leaf extract of C. macropodum showed high antiradical activity in comparison with the standard BHT with the highest inhibition at 1000 μg/mL (14.47) (Table 1). Compared to vitamin C, the reducing potential of the hydroalcoholic extract was not dose-dependent. The reducing power percentage is demonstrated in Table 1. The leaf extract of C. macropodum showed maximum reducing power (P ≤ 0.05). Analysis of the association between the reducing power activity and phenolic content indicated an R2 of 0.89, while its correlation with the flavonoid content was estimated at R2 = 0.88. Based on these values, phenolic compounds may have greater involvement in the reducing activity, compared to flavonoid compounds. where ABHT represents the BHT absorbance (standard) and Asample denotes the absorbance of C. macropodum. The calculated RAAs for C. macropodum leaf extract and BHT are presented in Table 1. TPC was calculated by adding the absorbance value in this equation. As shown in Table 2, TPC of C. macropodum leaf extract was 57.43 ± 0.25.
a Values represent means ± standard deviations for triplicate experiments. c Expressed as Quercetin equivalent (QU). TFC was calculated after entering the absorbance value in the equation. The mean TFC was 138 ± 19.80 mg/g (Table 2). The anti-C. albicans (n = 34) and anti-C. glabrata (n = 6) activities of hydroalcoholic extracts were confirmed in our analyses (Table 3). The presence of phytocomponents was confirmed based on the GC-MS analysis. 15 compounds were detected in C. macropodum (Table 4). Recently, the use of medicinal plants has attracted the researchers’ attention. Polyphenols are secondary metabolites, scavenging and quenching free radicals. Coruh et al. (4) showed that TPC of C. macropodum was 34 μg GA/mg. Ebrahimabadi et al. (19) reported that TPC was 29.3 and 30.2 μg GA/mg in the methanolic leaf and flower extracts of C. macropodum, respectively. According to a study by Alavi et al. (20), TPC of the dried extract of C. macropodum was 1.34 μg/mg. In our study, TPC was 57.43 μg GA/mg in the hydroalcoholic leaf extracts of C. macropodum, which is higher than the level reported in the mentioned studies. On the other hand, 15 compounds were identified in the hydroalcoholic leaf extracts of C. macropodum in this research. The major chemical constituents included palmitic acid, linolenic acid, linoleic acid, nonacosane, trimethyloctane, ethylilnoleolate, neophytadiene, benzothiazole, pyridinecarboxaldehyde, and oleic acid. Based on the findings, omega-3, -6, and -9 and palmitic acid were respectively unsaturated and saturated fatty acids. Unsaturated fatty acids showed higher concentrations than saturated fatty acids. The GC-MS analysis showed that fatty acids were dominant, which is in agreement with a study by Shafaghat (21). Different results regarding the amount of various fatty acids and chemical components may be related to various factors, including season, period of growth, geographical location, altitude, and methods. Youssef and Noaman (22) showed which benzothiazole derivatives have antibacterial and antifungal activities. Keri et al. (23) conducted a comprehensive systematic review of benzothiazole-based constituents and examined antifungal, antibacterial, antitubercular, antileishmanial, antimalarial, and other medicinal agents. The researchers showed that neophytadiene, a diterpenoid hydrocarbon that belongs to the group of phytanes, has antioxidant and antimicrobial activities (24-26). In the methanolic extract of Apamarga kshara, neophytadiene was a superior TvCK inhibitor compared to other identified compounds (27). Tao et al. (28) showed that octanal derivatives exhibited strong antifungal activity against Penicillium species. In addition, anti-Candida and antibacterial activities of some Chaerophyllum species showed moderate inhibitory effects (28-30). Ebrahimisadr et al. (31) reported that the extracts of C. macropodum have high antileishmania activities. Our results showed that hydroalcoholic leaf extract of C. macropodum (nearly 17.3% of the total chemical compound) has an inhibitory activity against bacteria and Candida, which is in agreement with the mentioned research and a study by Durmaz et al. (3). It may be due to the presence of compounds, such as benzothiazole, neophytadiene, and octanal, isolated from the hydroalcoholic extract. Therefore, C. macropodum is a candidate for the treatment of some diseases and is used in food industries, as well. On the other hand, the TPC results showed about 57.43 μg GA/mg in hydroalcoholic C. macropodum leaf extract, which is higher than the amount reported in other studies (4, 19, 20). Differences in the chemical compounds, content, and therapeutic outcomes related to antifungal and antibacterial activities may be due to various factors, such as season, extraction method, growth period, geographic location, and altitude. There may be a new Chaerophyllum species in our region (Rodbarak, Semnan, Iran), based on the plant ecotype theories. Therefore, we will conduct further research on DNA barcoding. 1. Dall'Acqua S, Innocenti G. Antioxidant compounds from Chaerophyllum hirsutum extracts. Fitoterapia. 2004;75(6):592-5. doi: 10.1016/j.fitote.2004.05.007. [PubMed: 15351116]. 2. Dall'Acqua S, Viola G, Piacente S, Cappelletti EM, Innocenti G. Cytotoxic constituents of roots of Chaerophyllum hirsutum. J Nat Prod. 2004;67(9):1588-90. doi: 10.1021/np040046w. [PubMed: 15387667]. 3. Durmaz H, Sagun E, Tarakci Z, Ozgokce F. Antibacterial activities of Allium vineale, Chaerophyllum macropodum and Prangos ferulacea. Afr J Biotechnol. 2006;5(19). 4. Coruh N, Celep AGS, Özgökçe F. Antioxidant properties of Prangos ferulacea (L.) Lindl., Chaerophyllum macropodum Boiss. and Heracleum persicum Desf. from Apiaceae family used as food in Eastern Anatolia and their inhibitory effects on glutathione-S-transferase. Food chemistry. 2007;100(3):1237-42. doi: 10.1016/j.foodchem.2005.12.006. 5. Zheng W, Wang SY. Antioxidant activity and phenolic compounds in selected herbs. J Agric Food Chem. 2001;49(11):5165-70. [PubMed: 11714298]. 6. Liu M, Li XQ, Weber C, Lee CY, Brown J, Liu RH. Antioxidant and antiproliferative activities of raspberries. J Agric Food Chem. 2002;50(10):2926-30. [PubMed: 11982421]. 7. Wolfe K, Wu X, Liu RH. Antioxidant activity of apple peels. J Agric Food Chem. 2003;51(3):609-14. doi: 10.1021/jf020782a. [PubMed: 12537430]. 8. Tesoriere L, Butera D, Gentile C, Livrea MA. Bioactive components of caper (Capparis spinosa L.) from Sicily and antioxidant effects in a red meat simulated gastric digestion. J Agric Food Chem. 2007;55(21):8465-71. doi: 10.1021/jf0714113. [PubMed: 17887802]. 9. Tepe B, Sokmen M, Akpulat HA, Sokmen A. Screening of the antioxidant potentials of six Salvia species from Turkey. Food Chemistry. 2006;95(2):200-4. doi: 10.1016/j.foodchem.2004.12.031. 10. Tlili N, Nasri N, Khaldi A, Triki S, Munné‐Bosch S. Phenolic compounds, tocopherols, carotenoids and vitamin C of commercial caper. J Food Biochem. 2011;35(2):472-83. 11. Burits M, Bucar F. Antioxidant activity of Nigella sativa essential oil. Phytother Res. 2000;14(5):323-8. [PubMed: 10925395]. 12. Cuendet M, Hostettmann K, Potterat O, Dyatmiko W. Iridoid glucosides with free radical scavenging properties from Fagraea blumei. Helvetica Chimica Acta. 1997;80(4):1144-52. doi: 10.1002/hlca.19970800411. 13. Kirby AJ, Schmidt RJ. The antioxidant activity of Chinese herbs for eczema and of placebo herbs--I. J Ethnopharmacol. 1997;56(2):103-8. [PubMed: 9174970]. 14. Hinneburg I, Dorman HJD, Hiltunen R. Antioxidant activities of extracts from selected culinary herbs and spices. Food chem. 2006;97(1):122-9. doi: 10.1016/j.foodchem.2005.03.028. 15. Tomaino A, Cimino F, Zimbalatti V, Venuti V, Sulfaro V, De Pasquale A, et al. Influence of heating on antioxidant activity and the chemical composition of some spice essential oils. Food chem. 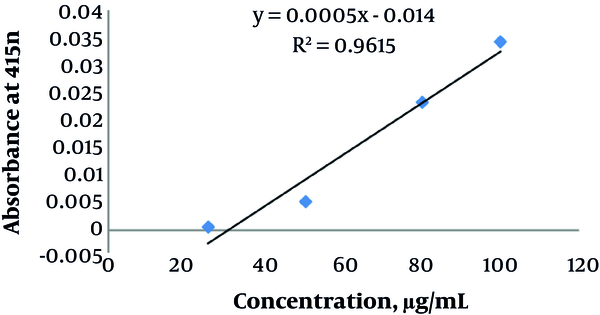 2005;89(4):549-54. doi: 10.1016/j.foodchem.2004.03.011. 16. Sadeghi Nejad B, Rajabi M, Zarei Mamoudabadi A, Zarrin M. In vitro anti-Candida activity of the hydroalcoholic extracts of heracleum persicum fruit against phatogenic Candida species. Jundishapur J Microbiol. 2014;7(1). e8703. doi: 10.5812/jjm.8703. [PubMed: 25147655]. [PubMed Central: PMC4138661]. 17. Bineshian F, Yadegari MH, Sharifi Z, Akbari Eidgahi M, Nasr R. Identification of Candida species using MP65 gene and evaluation of the Candida albicans MP65 gene expression in BALB/C mice. Jundishapur J Microbiol. 2015;8(5). e18984. doi: 10.5812/jjm.8(5)2015.18984. [PubMed: 26060567]. [PubMed Central: PMC4458353]. 18. Mohammadi A, Malek F, Dehpour A, Nazari H. Chemical composition and antibacterial activity of the essential oils of some medicinal plants. Afr J Agr Res. 2013;8(24):3151-8. doi: 10.5897/AJAR12.1941. 19. Ebrahimabadi AH, Djafari-Bidgoli Z, Mazoochi A, Jookar Kashi F, Batooli H. Essential oils composition, antioxidant and antimicrobial activity of the leaves and flowers of Chaerophyllum macropodum Boiss. Food Control. 2010;21(8):1173-8. doi: 10.1016/j.foodcont.2010.01.014. 20. Alavi SM, Farasat Kish R, Sadeghpour Tabaei A, Babaei T. [Comparison of the analgesic effect of sufentanil and morphine in patient controlled analgesia method after coronary artery by pass surgery]. Iran J Surg. 2010;17(4). Persian. 21. Shafaghat A. Biological activity and chemical compounds of the hexane extracts from Chaerophyllum macropodum in two different habitats. J Med Plant Res. 2013;7(20):1406-10. doi: 10.5897/JMPR12.067. 22. Youssef AM, Noaman E. Synthesis and evaluation of some novel benzothiazole derivatives as potential anticancer and antimicrobial agents. Arzneimittelforschung. 2007;57(8):547-53. doi: 10.1055/s-0031-1296647. [PubMed: 17915643]. 23. Keri RS, Patil MR, Patil SA, Budagumpi S. A comprehensive review in current developments of benzothiazole-based molecules in medicinal chemistry. Eur J Med Chem. 2015;89:207-51. doi: 10.1016/j.ejmech.2014.10.059. [PubMed: 25462241]. 24. Cheng MC, Lin LY, Yu TH, Peng RY. Hypolipidemic and antioxidant activity of mountain celery (Cryptotaenia japonica Hassk) seed essential oils. J Agric Food Chem. 2008;56(11):3997-4003. doi: 10.1021/jf703593v. [PubMed: 18473476]. 25. Cheng MC, Chang WH, Chen CW, Li WW, Tseng CY, Song TY. Antioxidant properties of essential oil extracted from pinus morrisonicola hay needles by supercritical fluid and identification of possible active compounds by GC/MS. Molecules. 2015;20(10):19051-65. doi: 10.3390/molecules201019051. [PubMed: 26492232]. 26. Palic R, Stojanovic G, Alagic S, Nikolic M, Lepojevic Z. Chemical composition and antimicrobial activity of the essential oil and CO2 extracts of the oriental tobacco, Prilep. Flavour Frag J. 2002;17(5):323-6. doi: 10.1002/ffj.1084. 27. Shaikh S, Aaqil H, Rizvi SMD, Shakil S, Abuzenadah AM, Gupta P, et al. Comparative inhibition study of compounds identified in the methanolic extract of apamarga kshara against trichomonas vaginalis carbamate kinase (TvCK): An enzoinformatics approach. Interdisc Sci Comput Life Sci. 2016;8(4):357-65. doi: 10.1007/s12539-015-0120-0. 28. Tao N, Jia L, Zhou H, He X. Effect of octanal on the mycelial growth of Penicillium italicum and P. digitatum. World J Microbiol Biotechnol. 2014;30(4):1169-75. doi: 10.1007/s11274-013-1539-2. [PubMed: 24162951]. 29. Demirci B, Koşar M, Demirci F, Dinc M, Başer KHC. Antimicrobial and antioxidant activities of the essential oil of Chaerophyllum libanoticum Boiss. et Kotschy. Food chem. 2007;105(4):1512-7. doi: 10.1016/j.foodchem.2007.05.036. 30. Kürkçüoğlu M, Başer KHC, Işcan G, Malyer H, Kaynak G. Composition and anticandidal activity of the essential oil of Chaerophyllum byzantinum Boiss. Flavour Frag J. 2006;21(1):115-7. doi: 10.1002/ffj.1539. 31. Ebrahimisadr P, Majidiani H, Bineshian F, Jameie F, Ghasemi E, Ghaffarifar F. Evaluation of the cytotoxicity effect of chaerophyllum extract on leishmania major and J774 cell line in vitro. Jundishapur J Nat Pharm Prod. 2017;12(3 (Supp)). e38948. doi: 10.5812/jjnpp.38948.